After the release of the movie Black Panther, Serena Williams was one of many celebs to take to social media with praise for Black Panther. Williams posted a photo on Instagram, showing that a special group of guests had accompanied her to the screening: Young girls from the not-for-profit organization Black Girls Code. This is important because while Black Panther has already been touted as a source of inspiration — even Michelle Obama weighed in to note as much — it presents an especially strong role model for young black women who are interested in STEM. 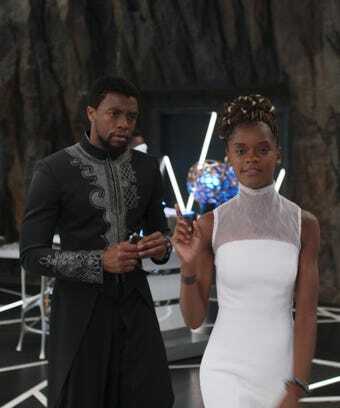 In the technologically advanced world of Wakanda, it isn’t a man who is behind the kingdom’s latest innovations, it’s the hero T’Challa’s younger sister, Shuri, played masterfully by Letitia Wright. Shuri is smart, funny, and, above all else, unapologetically confident in her creations. She runs the gadget lab where all of her innovations come to life, and you don’t even hear from others who tinker in the space, though you do see a few in the background. It’s very clear from the outset that this is Shuri’s domain. According to the National Center for Women & Information Technology, only 3% of the computing workforce in 2016 was made up of black women. In other areas of tech, the numbers are even worse: Only 0.2% of women of color earn venture capital funding. Issues of bias and pattern recognition are at play, but it’s also important that women continue to enter the space to begin with, Shauntel Poulson, a co-founder and general partner at the educational technology fund Reach Capital, told Refinery29 regarding VC funding.